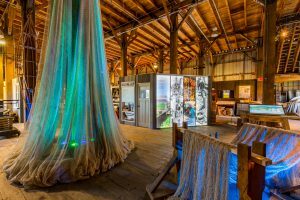 The 5 new interactive exhibits in the Seine Net Loft look at innovation and human ingenuity in the fishing and boat building industries of Steveston from the early 1800s up to today. 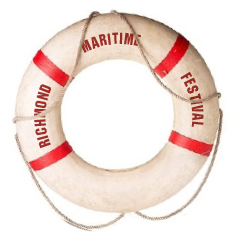 Explore fascinating stories of our changing waterfront and the individuals from many cultures who worked together to achieve prosperity during times of plenty and times of economic, political and social turmoil. 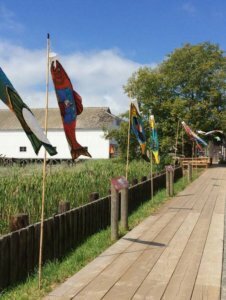 Engaging photographs, artifacts, films, audio clips, activity kits and an interactive touch screen will guide you through the rich history that shaped and nurtured present day Steveston. The fine craft of building wooden boats requires specialty tools of the trade. A shipwright’s tools (traditional boat builder) are their prized possessions. Lee Valley Tools is a Canadian company that specializes in fine crafted tools for shipwrights, carvers, woodworkers, luthiers (musical instrument makers) and artists. Join local elder and Squamish Nation carver to see his traditional and one of a kind artworks that connect with the ancient Coast Salish heritage of this land. Art also has an interesting connection to the festival site as his grandparents both worked in the canneries in the area. 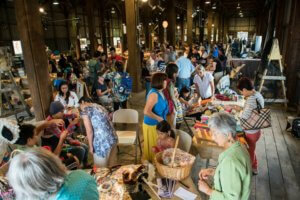 Lace making at a maritime festival? Did you know that lace making and fishing net making both originated together in historic time – they share many stories and stitches! Come meet local lace makers, students of world renowned lace maker Lenka Suchanek. Participate in making a traditional shell “Sailor’s Valentine” like sailors did back in the 1890’s… and bring your camera to take a photo of the valentines being made at the festival! Do you know how to make fishing nets or tie special sailors knots? Come and learn how and see all the different types of materials used to make floats for the fishing nets.